Visitors had a chance to buy traditional Russian handicrafts and souvenirs as well as try out Russian food items such as pirozhkis and shashlyk. 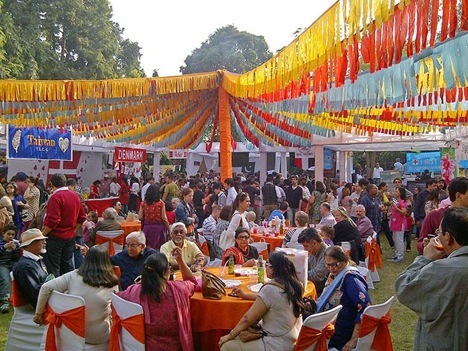 Indian visitors to the Delhi International Bazaar on Sunday got a taste of Russian culture thanks to the presence of diplomatic staff from the Russian Embassy in the Indian capital. Delhiites turned up in the thousands for the fair, which was first initiated by the Delhi Commonwealth Women's Association (DCWA) in 1952. Among them were Indians who came to learn about the culture and culinary delights of other countries and foreigners wishing to buy souvenirs. Children were welcomed by a variety of attractions and entertainment. Traditionally, each diplomatic mission in New Delhi gets an opportunity to represent their country and introduce Indian citizens to their country’s traditions and treat them to their exotic dishes. Some visitors were focussed on the Russian stall’s alcohol section, as Russian vodka is popular in India. The demand for Russian souvenirs was also high, and there were hardly any left by the end of the day. “For us, it is also a good platform to promote the richness of Russian culture. We sold traditional souvenirs such as matryoshkas, Khokhloma paintings, Pavlov Pasad shawls, amber jewelry and beautiful Christmas decorations as well as items produced by talented craftswomen and wives of the Russian embassy staff,” Alipova added. Among the bazaar’s traditional champions, there was also the German Pavilion, actively treating everyone to their Bavarian sausages, and the Turkish table where shawarma was cooked. Lovers of Asian cuisine enjoyed the dishes made by the Taiwanese and Singaporean diplomats. Every guest who bought a raffle ticket could take part in the draw of food packages as well as travel packages to Dubai, Hong Kong, Colombo, Singapore and Shanghai. The collected funds will go to charitable programs implemented by the organization.